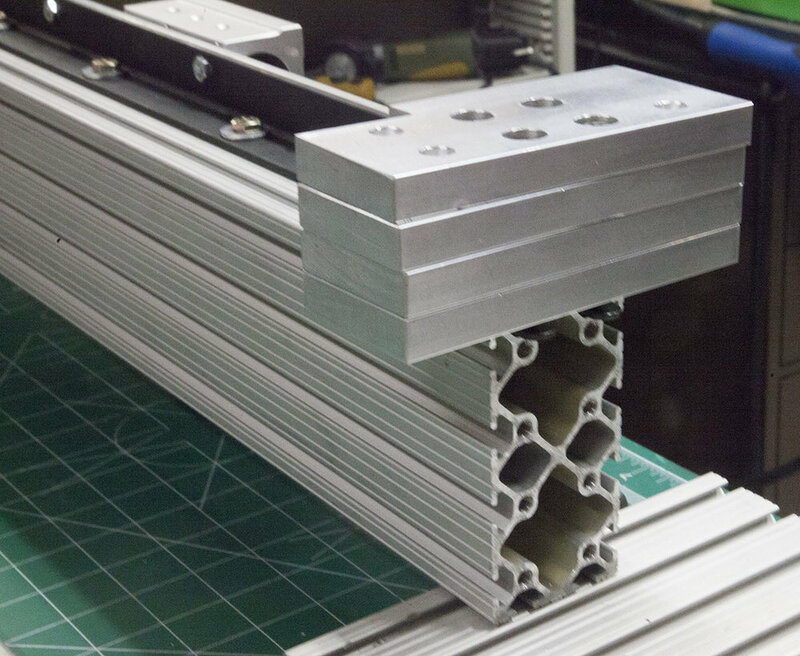 In this article, I am going to show you how to make the eight gantry risers out of aluminum. 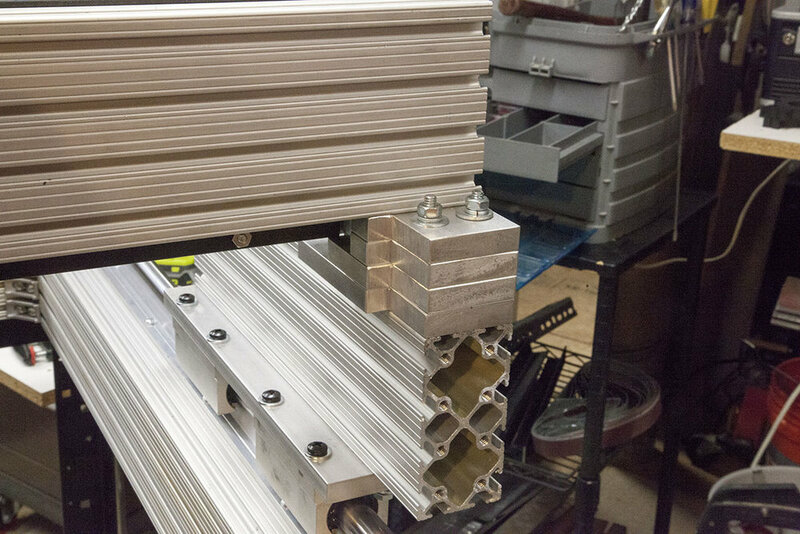 The gantry risers are made from eight pieces of 2” x 5” x 1/2” stock. At the time I started this portion of the build I did not have any 2” x 5” stock on hand. I did have some 2.5” x 5” x 1/2” stock so I decided to use that. Let’s start by looking at the template attached to a 2” x 5” piece of stock. 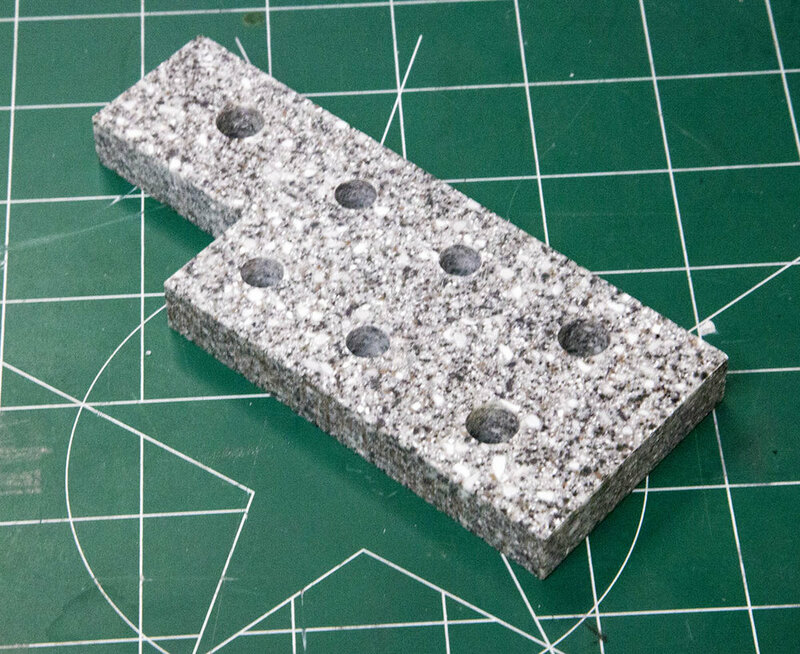 You need to drill seven holes and cut a corner out of each piece. Shown here is a gantry riser cut out of piece Corian. 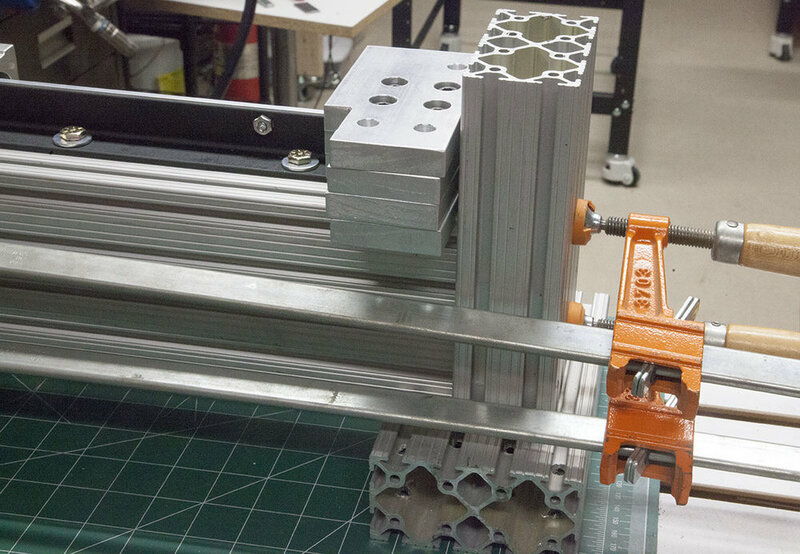 Here I attached the template to the larger 2.5” x 5” piece of aluminum stock. Because of the added width, I have to cut an extra 1/2” off the corner. In addition I also have to cut an additional smaller cut from the other corner. This is needed to keep from interfering with the gantry brace we will be adding later. At this point I thought I should just order some of the 2” x 5” stock and put a hold on the project until it arrives. Another option would have been to just cut off the extra 1/2” with one of my larger band saws. In retrospect, I don’t know why I did not take that option. Just keep in mind using the proper 2” x 5” stock will mean much less work if you decide to make these. The holes were punched. All holes were drilled with a 5/16” drill bit. The outer three holes we enlarged with a 3/8” drill bit. Now all that needs to be done is to cut the two corners out. I had to say a tried. If I only had one corner on one piece of stock, this might be a slow and painful option. But, for this project, No Way. This will work. It is a little slow but the weight of the saw does all the work. I also tried a carbide tipped blade on the reciprocating saw. Stick with standard metal cutting blades. This worked surprisingly well. A little hard to control but you get better with each cut. I am using a 10/14 TPI blade. Note that is not one of those expensive band saws. I picked it up at Harbor Freight. I have a stand I made for my Harbor Freight bandsaw. It is much easier to control the cut. Shown here is a small Proxxon bandsaw. It worked well. 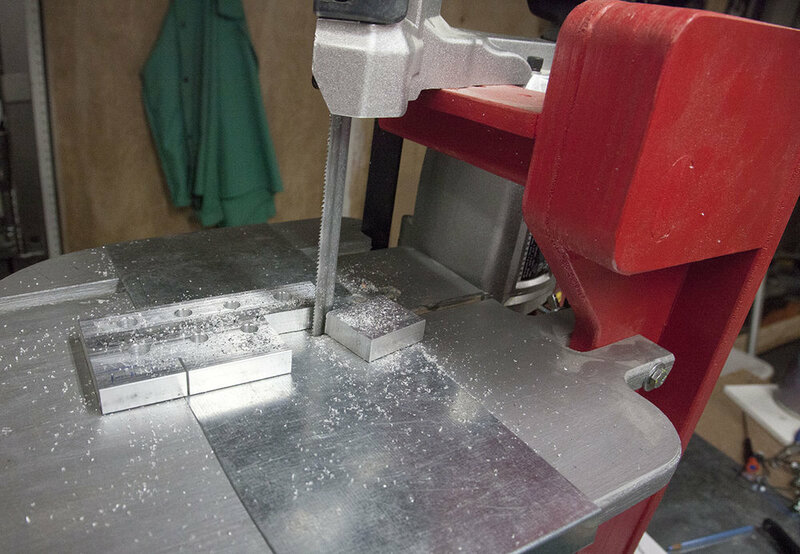 Any bandsaw with a bimetal 10 to 18 TPI blade will work. I flipped the gantry over with the bottom facing up and test fit the piece. Due to the extra width it comes in contact with the steel angle supporting the rail. I am going to have to make another cut. This is what I had to cut. Now it fits with the extra slot cut. Note that only two of these needed to be cut for each side to clear the steel angle. The bottom gantry riser has four pockets shown here. These are made the same way we did on the Y carriage adapter plates. In addition you don’t need to cut any of the corners. I needed to cut mine due to its size to clear the rear gantry brace that will be installed later. You are going to need the same washers you used on the Y carriage adapter plates. 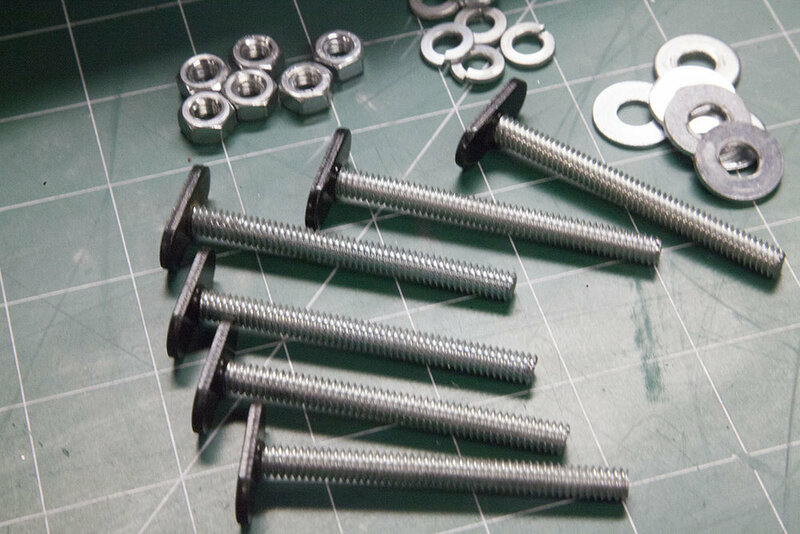 You will also need eight, 1/4-20 x 2” button head screws. The risers are assembled the same as in the book. Mine just look a lot different do to all the cuts I had to make to fit the larger stock. Before proceeding, slip the two extended trucks over the rails. Make sure the truck adjustment screws are located on the outside as shown here. Set the gantry with the bottom side up. You will need to place something about 1” thick under the lower truck to keep the gantry from tipping. Slip the assembly over the end of the gantry by sliding the T-nuts into the slots as shown here. Note that the large cutouts go towards the front of the gantry. Don’t tighten anything. Keep the assembly loose. Clamp some scrap to the ends of the gantry as shown here. Push the assembly up against the scrap and tighten the button head screws. Shown here is the completed gantry. You can follow the instructions in the book for attaching the gantry to the Y carriages. Shown here is an alternate way to install the gantry to the Y carriages. 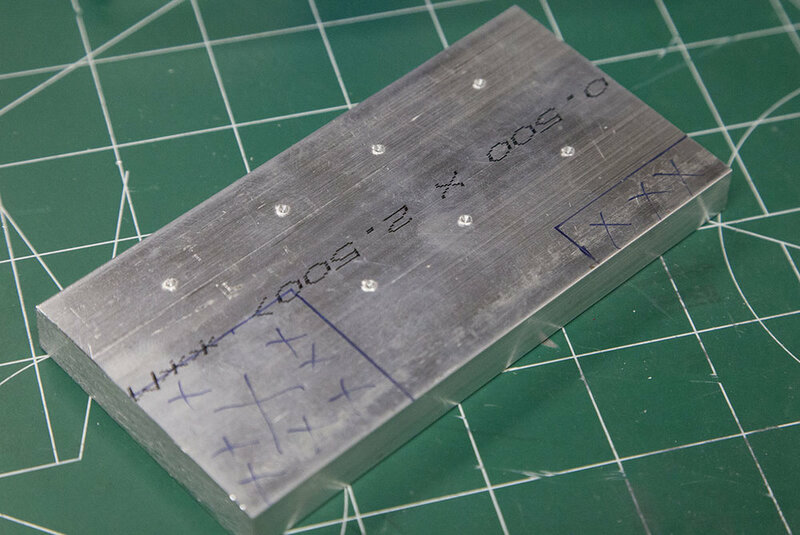 This method will work with any plate material. 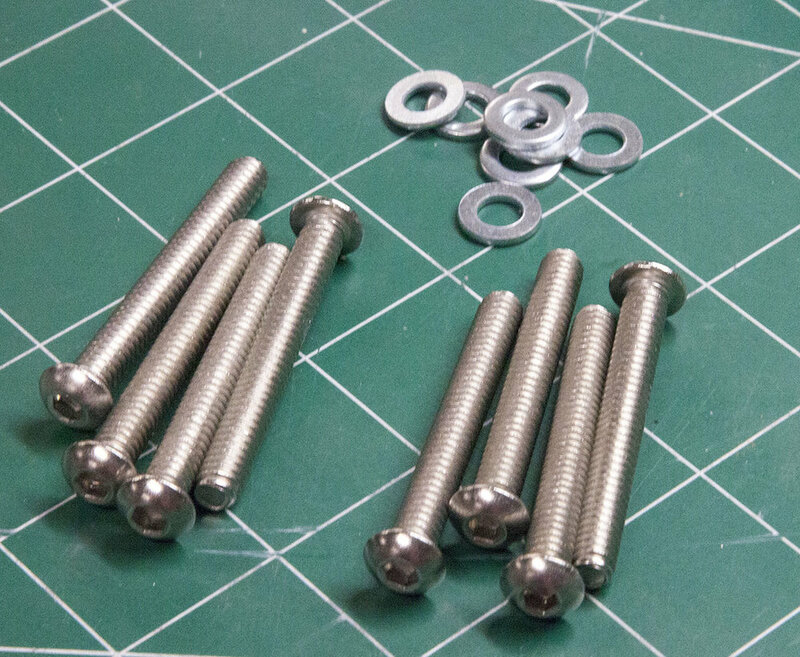 Attach the T-nuts to the threaded rod. The small lip on the T-nut should face the threaded rod. The other end should be flush with the end of the threaded rod. 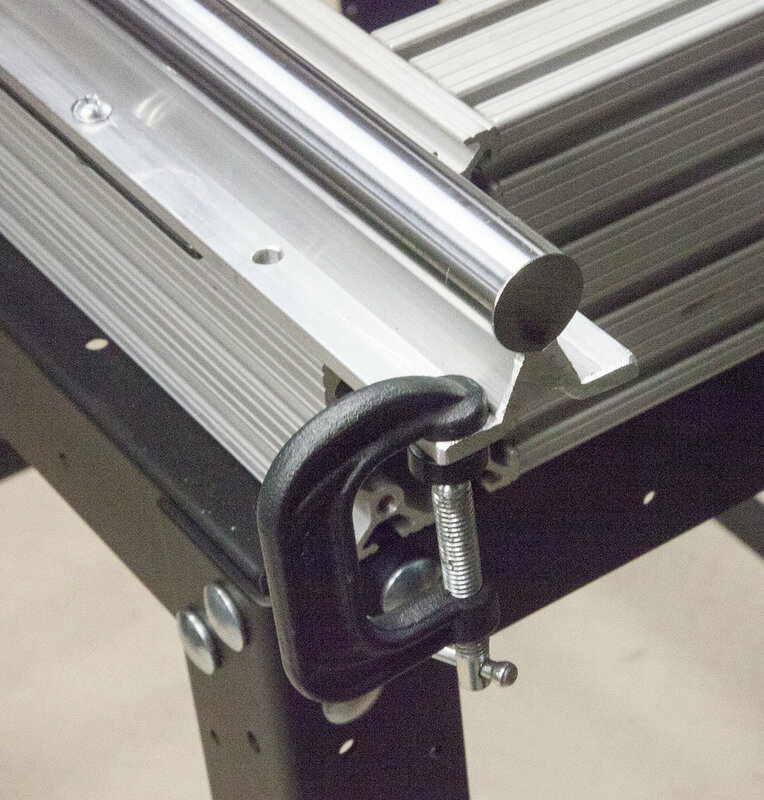 Lay the gantry on its back and insert the T-nut and threaded rod assembly into each of the three holes on both riser assemblies. Flip the gantry back over and add a 1/4” plain washer, 1/4” lock washer and a 1/4-20 hex nut to each of the protruding threaded rods. Before trying to install the gantry on the build, I lock it down. First, I move the gantry all the way to the rear. Leave enough room to install a small clamp. 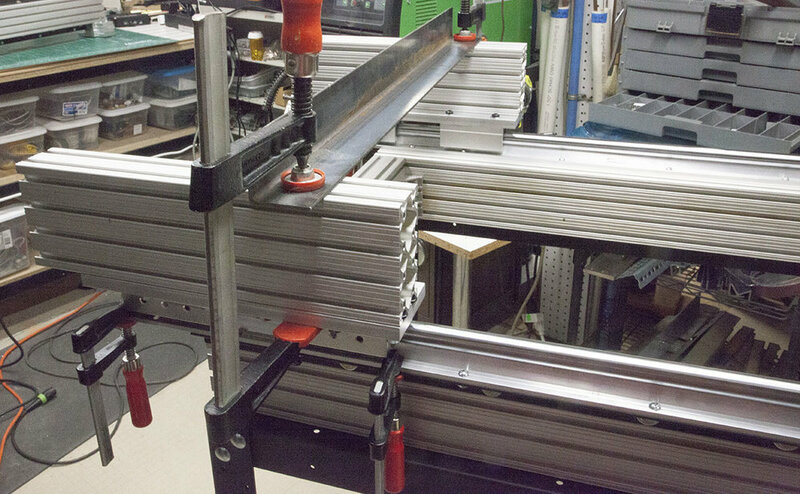 Next, I clamp a piece of steel angle across the top of the two Y carriage extrusions. Place clamps against the trucks to keep them from moving. If using casters they must be locked. 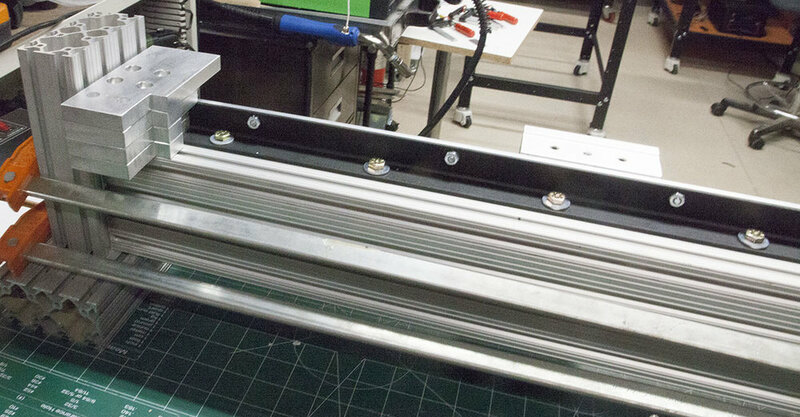 Slide the t-nuts on the bottom of the gantry risers into the top slots on the rear of the Y carriage extrusion. The rear of the risers should be flush with the rear of the Y carriage extrusion. The side of the gantry risers should be flush with the side of the Y carriage extrusion. Tighten the six 1/4-20 hex nuts and remove all the holding clamps. The gantry is now installed. In order to keep the trucks from running off the rails, add a small clamp to each corner. The over sized stock I used saved me some time in the beginning, it cost me in time and complexity. 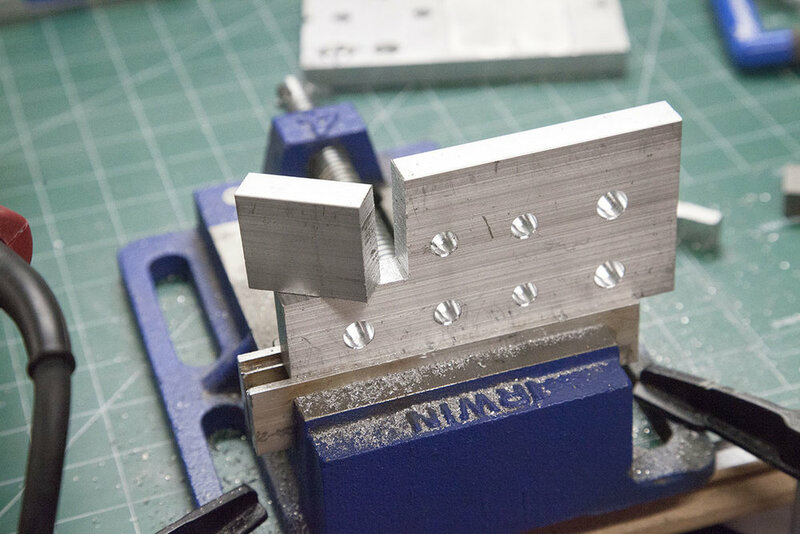 Please note that using the recommended 2” x 5” x 1/2” stock will result in a much simpler set of risers. If what I did here is a little confusing, the gantry risers you will be making are made exactly like those in the book, with the exception of the 1/2” pockets for the four internal bolts.